NEW YORK, Dec. 05, 2018 (GLOBE NEWSWIRE) -- Piedmont Lithium Limited (“Piedmont” or “Company”) is pleased to advise that the Company has increased its exploration land position to 1,383 acres. The land acquisitions include properties within the Carolina Tin Spodumene Belt (122 acres), and preferred locations for our concentrator and mine infrastructure (49 acres). Importantly, these acquisitions include 93 acres which are contiguous to the Core Property land package increasing it to a total of 622 acres. The Company also controls a 60-acre parcel in Kings Mountain, North Carolina for the site of the Company’s planned Chemical Plant. Piedmont has increased its land position by 184 acres to 1,383 acres. The most significant tracts, with regards to the current resource, are in the south-east and western portions of the Core Property. In the south east, a newly acquired 55-acre tract adds over 600 meters of highly prospective strike length along the F Corridor and a newly acquired 20 acres in the west adds over 400 meters of highly prospective strike length along the B Corridor. These two properties have significant potential to add to the current resource of 16.2 Mt @ 1.12% Li2O (reported June 2018) defined on the Core Property. Late phase 3 drilling, along the F Corridor, traced mineralization to the southwest suggesting that strike and downdip extensions of known spodumene bearing pegmatites could extend onto the newly acquired 55-acre tract. Within the 55-acre tract, one area of subcrop of spodumene bearing pegmatite has been identified, a grab sample from this subcrop assayed 1.21% Li2O. 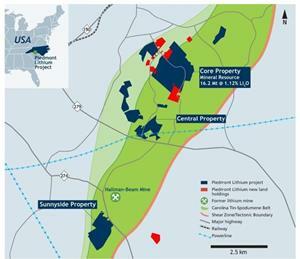 To the west, indicated and inferred classified resource blocks exist immediately adjacent to the northeast and southwest boundaries of the newly acquired 20-acre property. It is expected that mineralization extends onto the newly acquired tract. Piedmont is planning additional drilling to upgrade portions of the Inferred resource to Indicated classification, convert Exploration Target areas to Indicated where possible, explore the newly acquired properties and follow-up drilling on the Central property. Land acquisitions also feature the Company’s preferred concentrator and waste rock disposal locations as identified in the Company’s Updated Scoping Study announcement dated September 2018. The Company is designing condemnation drilling programs for 2019 completion in these areas. Finally, several off-trend properties have been acquired by the Company for consideration as potential future waste rock disposal, possible exchange properties for on-trend parcels, buffer zones, or as conservation targets for mitigation purposes. Piedmont Lithium Inc. has entered into exclusive option agreements and land acquisition agreements with local landowners, which upon exercise, allow the Company to purchase (or in some cases long-term lease) 1,383 acres of surface property and the associated mineral rights from the local landowners. The new properties being the subject of this announcement total 184 acres, of which 142 acres have been acquired under land acquisition agreements and 42 acres have been optioned under land option agreements, on substantially the same terms as the Company’s existing land option agreements. The Company also controls a 60-acre parcel in Kings Mountain, North Carolina for the site of the Company’s planned Chemical Plant. The Company’s strategy remains to consolidate the region between newly secured and historic landholdings with emphasis towards on-trend properties and sufficient off-trend for potential infrastructure development, mitigation, and future land exchanges.